The Netgear CG3000 has a web interface for configuration. You can use any web browser you like to login to the Netgear CG3000. In this example we'll use Internet Explorer. Then press the Enter key on your keyboard. You should see a dialog box pop up asking your for your Netgear CG3000 username and password. 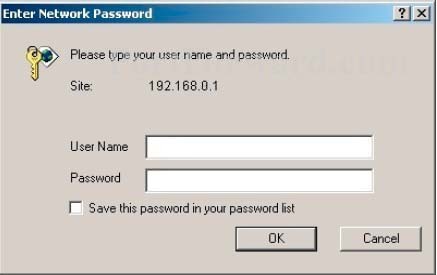 You need to know the username and password to login to your Netgear CG3000. All of the default usernames and passwords for the Netgear CG3000 are listed below. You should now see the Netgear CG3000 Home Screen, which looks like this. 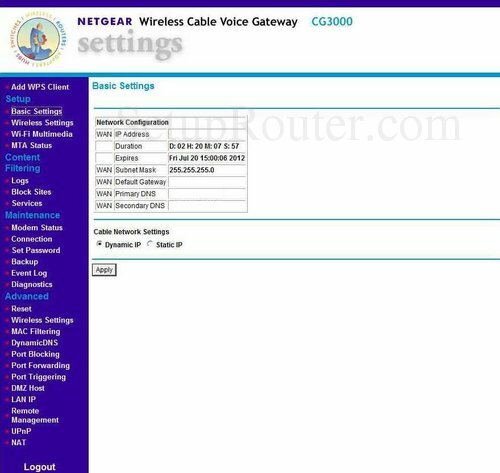 You begin on the Modem Status page of the Netgear CG3000 router. To change the Domain Name System (DNS) settings, click the choice on the left side of the page labeled Basic Settings. You are now on the Basic Settings page. This is the only screenshot we have of a DNS server for this router. Generally the WAN DNS is used for updates and the LAN is primarily used for day to day use. If you can find another DNS server page for this router, please let us know. We still recommend setting this DNS server if possible. If your Cable Network Settings are set to Static IP enter the primary address of the DNS server you want to use in the boxes labeled Primary DNS. Enter the secondary address of the DNS server in the boxes labeled Secondary DNS.